California’s gateway cities are unique among municipalities. Whether you’re talking about Bellflower, La Mirada, Lynwood, Norwalk, or any other localities in the bunch, each is distinct from the other; each has a character all its own. They do have one thing in common, however – plenty of activity. Night or day, rain or shine, there’s a lot happening on their well-traveled streets. Not surprisingly, traffic can get mighty thick at times, particularly when construction projects and special events enter the picture. Understandably, traffic control in Gateway Cities must be of the highest caliber. Which is why this part of the world frequently calls on Roadway Construction Service when traffic needs taming. The highest caliber describes our services to a tee. Successful road traffic control is the result of a double advantage we bring to the table. We not only know the ins and outs of maintaining order on the streets; we also are thoroughly familiar with the sprawling region known as Gateway Cities. In combination, this powerful one-two punch enables us to be the premier provider of traffic control in Gateway Cities. Road traffic control in this bustling region of the world depends on a multi-dimensional approach. The first of these is the traffic barrier dimension. Crucial for the maintenance of order on the roads, traffic barriers require the upmost attention to detail. Picking the right ones is both an art and a science. Like the Gateway Cities, each on is unique. Jersey barriers have a different purpose than bright orange cones. The same uniqueness applies to all the other traffic barricade rental. Selection and deployment require considerable finesse. Barricade deployment begins well in advance, somewhere behind the scenes in our planning department. Tireless, sharp, and dedicated, our traffic control planners calculate every need early in the game, ensuring road traffic barricades, traffic control flaggers, and every other crucial variable are exactly where it should be – when it should be there. Invariably, this supreme effort by these traffic control engineers results in rock-solid plans that leave no stone unturned. And it’s a good thing. Because the plans we concoct will be scrutinized mercilessly by local decision makers during the permitting process. If the fruits of our labor favorably impress, permits are granted without quuestion. If not, it’s back to the drawing board. We’re pleased to say that we never make that return trip. Consequently, client projects are never delayed by tangles and technicalities. The first time’s the charm as far as we’re concerned. Would you like to learn more about premier traffic control in Gateway Cities? 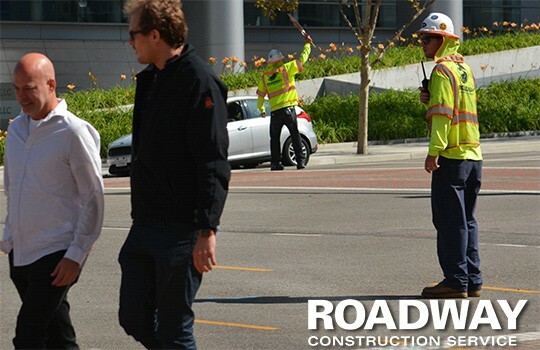 Reach out to Roadway Construction Service any time. We’ll be happy to provide additional information and answers to all your questions.